All our tools are handcrafted and are the result of years of baking in our woodfired ovens mainly for weekly farmers market. All Handles are made of recycled Kauri except for the Amber shovel which has a 35mm diameter short pine handle. The embers shovel is the only tool made of stainless steel because it is designed to stay at the oven entrance all the other tools are in aluminium as it is lighter and less likley to damage the oven floor. Mainly used to extract the coals from the oven floor into the shovel but also very handy to drag baking utensils from deep inside the oven to the oven entrance. Used to clean the oven floor before baking bread or pizza. After using the embers rake the oven floor is free of coals but some ashes remains and you have to remove them before any dough is moved onto the oven floor. The oven is usually very hot at that time so you should have a bucket of clean water and immerse the broom in it before cleaning the floor and repeat immertion every 2 strokes as Natural fibres will burn in intense heat unless they are kept wet at all time. This tool is designed to be held with only one hand and part of the forearm in such a way that your other hand is free to use the Amblers rake or the natural fibre broom to fill up the shovel with coals or ashes. It is normally used only to take the pizza and place it on the oven floor. A smaller peel like a Bread or a baguette peel is used to rotate or extract the pizza. If you don't bake directly on the oven floor you don't require a pizza peel. For bread and general use. This tool is indispensable to ready the fire for the specific bake you have planned. The broom is the most sensitive to high heat other tools are much more tolerant but should always be removed from the oven as soon as the task is over. If a peel gets damaged on the front rim use a file never a hammer to restore the edge. 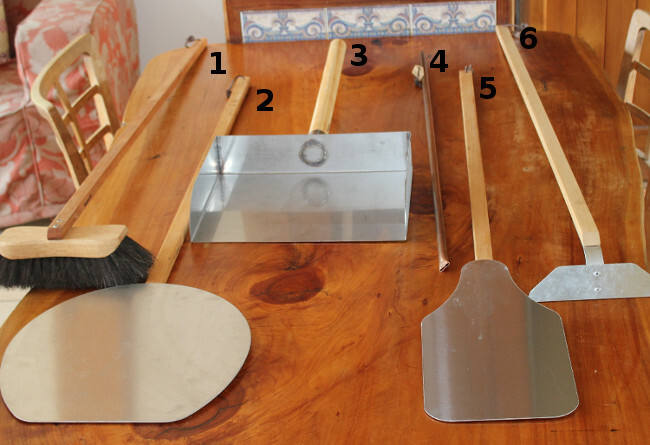 "Utensils for wood fired ovens"
All tools used inside the oven are made of aluminium except for the bread peel who is also available in microcapa. The broom is made of natural fibre and should be wet when used in a hot oven. Air blower is indispensable to revive the fire. Baguette peel (Not shown on photo) is useful not only for baguettes but can also be used to cook pita bread or to load wood in the oven. When baking bread or pizza it is important to start baking on a very hot stone! To achieve that you must preheat the oven with a baking stone inside and use the right peel for the job. The peels are identical to wood fired oven peels except for the handle which can be shortened if requested. We also offer a 300 * 300mm * 25mm New Zealand stone which can absorb and retain a lot of heat. Check out our cookware which is quite remarkable as you can use it to cook on your oven top (gaz, electric or wood) inside your oven or your microwave. Most clay pot need to be placed in a cold oven and are subject to gradual heating but our Portuguese ceramic cookware is suitable to cook in a wood fired oven as it can be placed in a hot (or cold) oven. Just send us an email ( henri@breadnz.com ) with your order details and your delivery address and we will reply with total cost including freight and direct credit information.